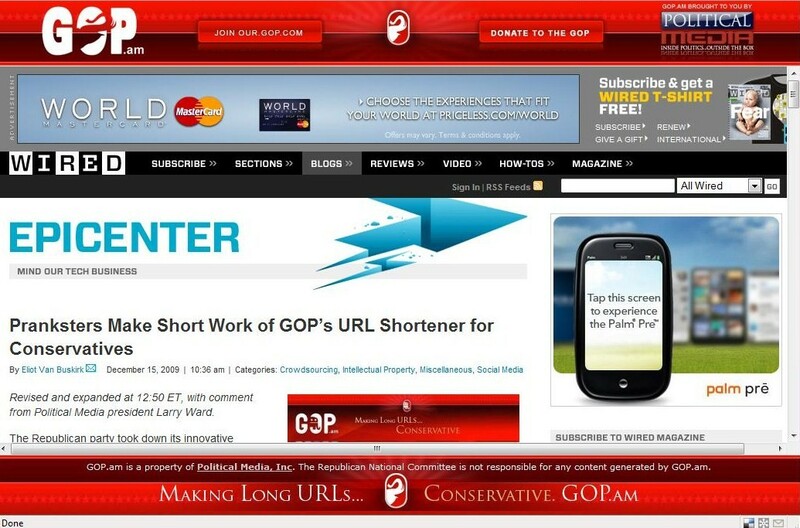 The Republican Party caught plenty of deserved flack for the hamfisted rollout of its website this year, but in the last couple of days there has actually been a pretty innovative development from the online right: the GOP.am URL shortener. There are plenty of these handy devices for condensing website addresses, but GOP.am is different because it frames every website with banners directing users back to the sign up and donate sections of the GOP website. Playful pranksters have used the link to put the GOP brand around less-than savory sites. And, as the Bivings Report notes, the banners take up lots of space and have no obvious method for users to get rid of them. But it’s also significant that this is not, as of yet, an official RNC project. Remember that during the 2008 campaign, the Obama campaign benefited from user-generated videos and iPhone applications. Even their MySpace page was started by a supporter. Political movements which are successful online or offline have major components which are created by activists outside of the major party. That makes projects like GOP.am important benchmarks to measure grassroots innovation – even if it isn’t perfect.